Polish affinity to herbs has a long history, but is also very much in tune with the modern ideas of healthy natural living. What can be seen as a trend in some Western countries, is an inherent element of Polish culture. So when did this obsession start, and how does one lead a healthy, herbal life – the Polish way? Feeling nervous? Drink some lemon balm tea! Had too much to eat? Mint tea is the answer! Sore throat? Sage will help you for sure! Your eyes hurt? Put some camomile tea bags on them! Take milk thistle for your liver, horsetail for your kidneys, and fennel for your tummy. That’s the kind of health advice you might hear from a Pole when you’re not feeling great. And you don’t even need to go to the pharmacy or a specialist herbal store – most of these remedies are easy to find in any grocery store you come upon. Herbs are the oldest treatment out there, and folk medicine has made use of them all around the world since time immemorial. 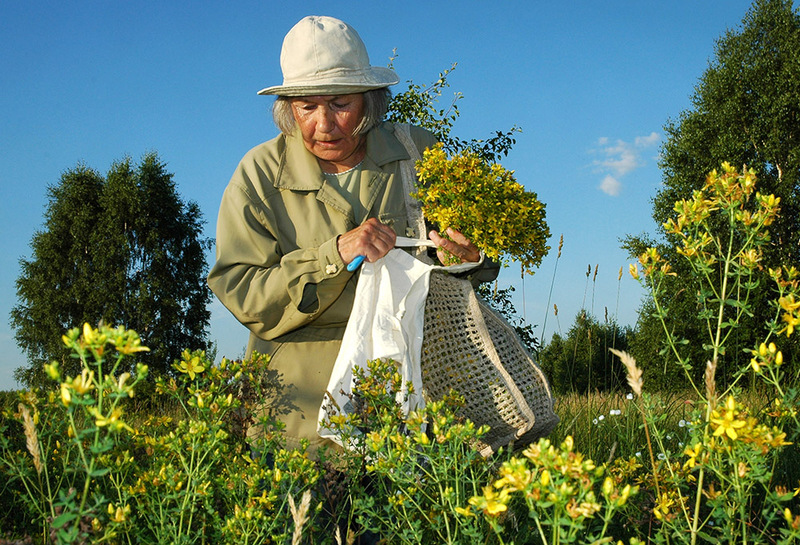 In Poland, traditional remedies have always been connected to the plentiful fields and forests and – as in the case of the Eastern Orthodox szeptuchy in Podlasie, who even today treat diseases with natural remedies while praying to God to heal their patients – herbal treatments often connect the remains of pagan traditions with Christian faith. Major scientific research about herbs began in the 16th century thanks to the famous Swiss physician and alchemist Paracelsus. More and more ‘herbarias’ (zielniki), namely collections of preserved plant specimens and the gathered data about them, were published all around Europe, as well as treaties about plant characteristics and uses. They quickly reached Poland through translation and were also compiled by Polish biologists such as Stefan Falimirz (author of the first scientific treaties about herbs written in Polish in 1534 entitled O Ziołach i Mocy Ich (On Herbs and Their Power), Maciej Miechowita and Marcin Siennik. Szymon Syreniusz created the unique Zielnik in 1613, in which for the first time he described 765 plants growing in Central and Eastern Europe. Another figure worth mentioning is Michał Boym, a 17th-century Polish Jesuit monk who was one of the first Westeners to travel to China and write extensively about its flora and fauna, and particularly, traditional Chinese medicine. 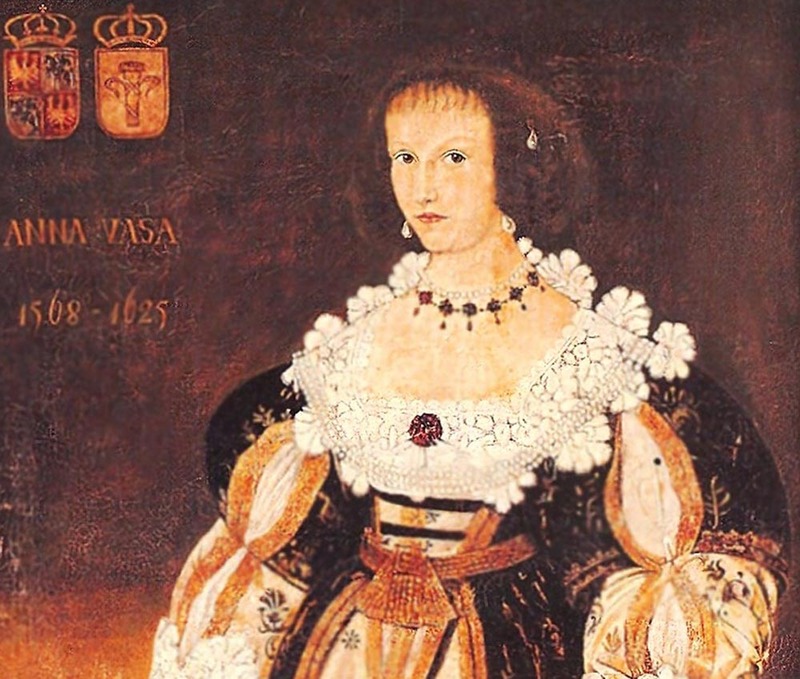 Anna Wazówna, the daughter of King Jan III Waza, was the author of the first Polish zielnik made with specimens of dried herbs, but unfortunately it was destroyed during World War II. The princess was very interested in plants and their health benefits, she even had a laboratory and a herb garden. And she wasn’t the only one: plants at the time weren’t just randomly growing in fields and meadows, but were also grown in gardens by wealthy citizens and monks. Herb honeys, vinegars, liqueurs and oils were stacked in their pantries. This was particularly the case with Bonifratrzy – the so-called Brothers Hospitallers of Saint John of God – who came to Poland in the early 17th century and are well known for their holistic efforts to cure diseases using natural remedies. Even today in their herbal shops and pharmacies in Warsaw, Wrocław, Kraków, Łódź, Piaski Legnica and Cieszyn, they offer herbal mixtures and drops, cosmetics and nalewki as well as free medical advice. They say that willow bark helps with pain, hawthorn fights hypertension and pansy treats acne, all while reminding their patients that herbal medicine is not an alternative to going to the doctor, but only a helpful tool which helps lessen the symptoms. (…) then a naked Chinese man enters the case and tramples on it with his feet: it’s easy to suppose that even if he does it with care, one should fear the sloppiness of sweaty feet. This magazine is essential to all adherers of natural healing as well as those who collect and grow therapeutic herbs! A new source of national wealth! The first magazine of this kind in Poland! Apart from being a physician, Breyer was also fascinated with esotericism, parapsychology and spiritualism – topics popular after WWI among the European intellectual elite. Franciscan monk Andrzej Czesław Klimuszko was another important figure in herbalism in Poland – he wasn’t only famous for his ability to heal people with efficient mixtures, but also for his apparent gift of clairvoyance: he read peoples’ future, looking at their photos, and predicted, among other things, that a Pole would become Pope. Klimuszko also spoke about World War III, which he claimed is due to begin ‘in the South, when all treaties will have been signed, and eternal peace will have been pronounced’. After World War I though, phytotherapy did start to be treated as a part of conventional medicine: traditional, herbal remedies were now being researched using modern scientific methods. In 1930, the Polski Komitet Zielarski (Polish Herbal Committee) was established and is still exists today helping herb production and educating people about the virtues of plants. Jan Muszyński, the author of Ziołolecznictwo i Leki Roślinne (Herbalism and Plant Medicine) was a leader of this branch of medicine in Poland, which aims to extract natural oils and essences from plants to use them in pharmaceuticals. Another important figure was Franciscan monk Grzegorz Sroka. 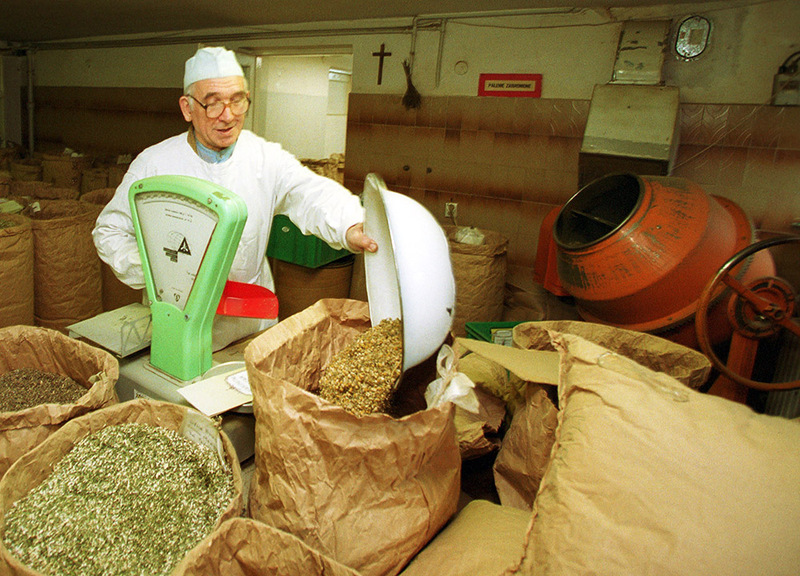 Hundreds of people travelled to Rychwałd – a village in Silesia – where he offered advice to the suffering and treated them with herbal mixtures. In 1949 in Warsaw Centrala Zielarska (Herbal Headquarters) was established, which later morphed into Herbapol – a company which is now the leader of herb production in Poland and whose logo you see on the packages and bottles of popular teas and syrups. Foraging wild herbs: a modern hipster trend? While mint, fennel and camomile teas, as well as herbs used in the kitchen such as rosemary, thyme or basil, are pretty much known to every Pole, there’s now a booming interest in wild lesser-known plants. An ambassador of foraging them is ethnobiologist Łukasz Łuczaj, acclaimed author of books such as Dzikie Rośliny Jadalne Polski: Przewodnik Survivalowy (Poland’s Wild Edible Plants: A Survival Guide) and Dzika Kuchnia (Wild Cuisine). He organises workshops and foraging walks for people interested in using wild plants such as ground elder, sweet flag or hogweed (which is called barszcz in Polish and gives its name to a variety of sour soups that today are made mostly from beetroots) in their kitchen or growing a ‘wild garden’. The DIY trend, encouraging people to make their own cosmetics and preserves, as well as the love of everything ‘organic’ and ‘natural’ is growing in Poland: blogs and books about the different uses of plants are booming. 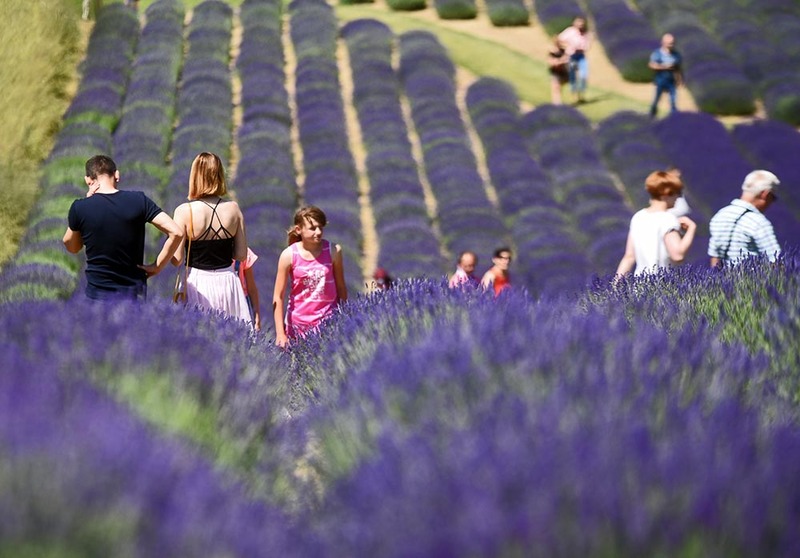 For some it has become a lifestyle choice: tired big-city folk go on vacation to places such as Lawendowe Pole in the village Nowe Kawkowo in Warmia, where Lawendowe Muzeum Żywe (Living Lavender Museum) was established, dedicated to growing this fragrant plant, usually associated with Provence. They also head to Beskid Niski, where the Dzikie Stoły (Wild Tables) restaurant event is shines a light on natural locally-sourced cuisine booming with wild herbs. Stock your pantry with herbal teas: as you remember from our intro, there’s mint for digestion, and camomile for your tummy, tired eyes and general well-being. 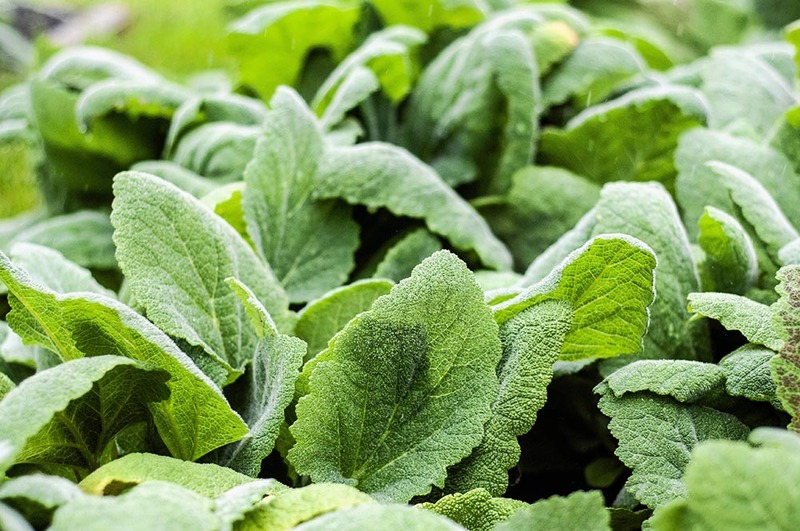 Milk thistle is great when you’ve had too many drinks the night before, and sage or thyme will help you fight your cold. Build a Polish-inspired spice rack: we use lovage to make rosół (and as an aphrodisiac! ), spice our soups, stews and smalec (lard spread with fried onions) with marjoram, while our meats are laced with juniper. Have you ever tried to make your own nalewki? In Poland it’s one of our national sports, and even though most often we make fruit liquors such as wiśniówka (cherry liquor) and pigwówka (quince liquor), the healthiest ones are made with herbs such as mugwort, angelica or mint. Try to make your own cosmetics with glycerin or coconut oil as a base, using herbs such as nettle, dandelion or hackberry. If that’s too much of an effort, look for natural, herb-based cosmetics – preferably Polish ones if you have the chance! Go herb-foraging! Or at least take a good look around when you’re on a walk, even in your own garden. There might be treasures there that you’ve never noticed before! So, now that you have some practical takeaways and are filled with historical background, we hope you’ll make use of the Polish herbal life wisely!